Overview - What if your own family stood in the way of everything you worked for? Bobby Green (Joaquin Phoenix) has forsaken his name to escape his family and their tradition in law enforcement to pursue his ambitions as a Brooklyn nightclub owner. As he turns a blind eye to the drug dealers around him, he comes face to face with the family he abandoned when his brother (Mark Wahlberg) and father (Robert Duvall) crack down on the club. Now Bobby must choose a side. Is he going to turn informant or will he help run the biggest crime ring in New York history? I get genuinely excited when I see a list of amazing actors attached to the same film, and I’ll often plop down my nine bucks based on the potential of a film's cast alone. Sadly, this habit often leads to disappointment. While great actors can enhance a great film, they can't overcome an inadequate script. Take 'We Own the Night' for example -- surely phenomenal actors like Mark Wahlberg, Joaquin Phoenix, and Robert Duvall couldn't all have made the same tragic mistake. Could they? 'We Own the Night' tells the initially compelling story of two feuding brothers in late '80s New York, both of whom were raised by a gruff police chief named Albert Grusinsky (Robert Duvall). 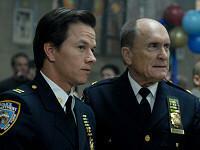 Joe (Mark Wahlberg) was the good son, who followed in his father's footsteps and became a police captain in the same precinct. Robert (Joaquin Phoenix) on the other hand took a different path, becoming the manager at a nightclub catering to the city’s seedy underbelly of drug dealers and organized crime. When Albert and Joe request Robert’s aid in an investigation, he recoils, immediately rejecting their pleas, but when his family is placed in the crosshairs of a group of dangerous Russian criminals, Robert must decide where his loyalties really lie. Unfortunately, the film falters in its predictable third act, ultimately failing to give its powerful ensemble cast a lot to work with. For starters, the script is an unapologetic mish-mash of better films like 'Carlito's Way,' 'The Departed,' and 'Scarface,' with a healthy dose of sibling rivalry and father issue cliches thrown in for good measure. Wahlberg, Phoenix, and Duvall do exceptional jobs with their paper-thin characters, but ultimately fall victim to several clumsy story developments. 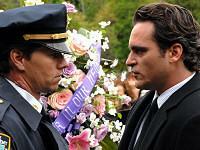 Wahlberg's character in particular fails to develops, never emerging from his father's shadow. The film is dominated by Phoenix, with Wahlberg merely circling the plot like an insignificant satellite. It's even worse for Duvall who gets conveniently pigeon-holed as a curmudgeonly old sage, simply functioning as a one-note, moral compass for Phoenix's anti-hero. My biggest gripe with 'We Own the Night' is that there's real promise buried within each scene. A proper rewrite could have kept the story intact while injecting its more superficial areas with real life. Phoenix's role as the prodigal son, Wahlberg's role as the family’s faithful but jealous loyalist, and Duvall's part as the quick-to-forgive father would have been benefited from a handful of additional scenes. For all the film's style, there is little substance. If the film does one thing well, it’s in recreating the high-fashion '80s nightlife in a way that feels authentic. The sets are meticulously designed, making the most of the oft-ridiculed fashions of the time, and the music and costumes rarely feel like a distraction. Director James Gray ('Little Odessa,' 'The Yards') establishes a living, breathing world that seems convincing, despite the pitfalls of the time period. I often forgot the story was set in 1988 -- the entire film could have been set in 2008 without skipping a beat. I'm sure quite a few people will enjoy 'We Own the Night' -- it admittedly has all of the elements of a successful crime classic. Sadly, Gray never closes the deal properly, truncating his characters' inner conflict to the point that it undercuts the story’s impact. This isn't a bad film by any stretch of the imagination, it just kills me to think that a stronger script might have placed this one at the same level as other heavyweights in the genre. Sony presents 'We Own the Night' with a stable 1080p/AVC transfer that renders its lush '80s nightlife with ease. The palette may look as if its been coated in amber-hued honey, but the color choices drift from warm to cold over the course of the film, assisting the tone of the evolving story. I was pleased to find deep black levels that provided a welcome level of dimension to the picture without hindering visibility at all. Detail is very good as well. Better still, I didn't detect any edge enhancement, artifacting, or source noise. However, there are a few minor issues that keep 'We Own the Night' from perfection. First off, clarity tends to fluctuate, leaving quite a few shots feeling softer than the rest. Second, digital noise creeps in, particularly during nighttime scenes when the video is otherwise undisturbed by crush or delineation problems. Finally, the film's moderate veil of grain tends to spike at times, flooding the screen with quick bursts of salt and pepper that distracted me each time they suddenly erupted. Still, these issues are relatively small and only make a small dent in an otherwise impressive effort. 'We Own the Night' features a confident Dolby TrueHD 5.1 surround track that doesn't get to play around as much as one might expect in a police drama. The film is largely dialogue driven, and as such, the soundfield is heavily weighted in the front channels, only opening up during car chases and gun fights. Ambience is pretty good, but there were a few moments when I felt the city would sound more realistic if it were more expressive. Dynamics are strong, lending solid LFE support to gunshots and the bass beats of the soundtrack. Treble tones fare just as well -- dialogue is clean, sound effects are spot on, and subtleties in the rear channels make immersion a bit easier. My biggest problem with the audio is that some of the dialogue is mumbled at times, making it difficult to understand everything that was being said. Admittedly, this might all simply be the result of Phoenix's increasingly hushed delivery, but I've heard quieter actors registering more clearly on quieter tracks. Ultimately, the TrueHD track on 'We Own the Night' isn't cause for too much concern and handles its somewhat underwhelming mix well. The Blu-ray edition of 'We Own the Night' includes all of the special features that appear on the standard DVD. As an added bonus, all of the video content is presented in high definition. Audio Commentary -- Director James Gray delivers a decent, informative commentary that will please fans of the film, but I couldn't help but find it lacking a bit. While he digs into many nuances of the story, the shoot, and his experiences with the actors, he merely skims the surface and avoids diving into the more interesting aspects of the production alluded to in his chat. The track might have really come alive if he’d had someone in the room with him to make his commentary a conversation. The presence of any cast member would have prevented Gray from becoming sidetracked in several long-winded, technical explanations about scenes he felt were particularly difficult to shoot. Tension: Creating We Own the Night (HD, 15 minutes) -- This fairly standard featurette includes interviews with Gray, Wahlberg, Phoenix, and other members of the cast and crew. They discuss the on-set atmosphere, the script, and their reactions to the story. Police Action: Creating Cops, Cars, and Chaos (HD, 10 minutes) -- Interviews, behind-the-scenes footage, and stunt videos pepper this short featurette that explores the key action sequences in the film. While the featurette never really shows off anything you haven't seen before, it's well edited and presents all of its information in a compelling, succinct narrative that keeps it pretty interesting from beginning to end. A Moment in Crime: Creating Late '80s Brooklyn (HD, 9 minutes) -- This brief featurette is the driest portion of the supplemental package, simply providing a quick tour of the costumes, music, and locations used in the film to replicate the unique decadence of the time. It's nothing you haven't seen before. Trailers (HD, 6 minutes) -- '30 Days of Night,' 'Walk Hard: The Dewey Cox Story,' and a montage of other Sony Blu-ray titles. 'We Own the Night' is a disappointment in my eyes because it doesn't cash in on the full potential of its cast. For every excellent performance, the story is riddled with holes and flaws that keep the characters at a distance. This Blu-ray edition is also a mixed bag -- it has a strong video transfer, but suffers from a rather underwhelming TrueHD track and a small smattering of supplements. In the end, you should give this one a try, but be cautious before you make a blind buy based on the strength of its cast alone.